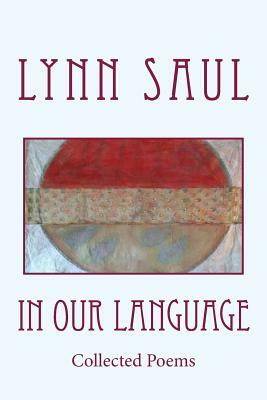 "In Our Language" is a collection of poetry by Lynn Saul. Lyric and narrative poems deal with issues of family, living in the Southwest, Jewish heritage and practice, feminist experience, and many other issues of life in the 20th-21st centuries. Saul's poems explore language using a number of languages in addition to English, always focusing on how language derives from and influences our perceptions of experience. Lynn Saul is a poet and writer whose work has been published in a number of literary magazines and anthologies. She has also published several chapbooks of poetry, including Family, I am Trying to Understand, and Nashim B'Midbar/Women in the Desert. Her book about her exploration of her Hungarian Jewish family, Learning to Say "Satoraljaujhely," was published by Jumping Cholla Press in 2010. Lynn Saul earned an MFA in creative writing at the University of Arizona. After a long career as an attorney, including eight years as a legal services lawyer on the Tohono O'Odham Nation in southern Arizona, Saul retired from the practice of law to focus exclusively on writing and teaching. She teaches writing and humanities at Pima Community College in Tucson, Arizona. She also leads community and synagogue writing workshops.